Education is Celebrated at Malaika Early Learning Center | Hupy and Abraham, S.C. Giving Back to the Community Through Backpacks Watch this video to learn more about Hupy and Abraham and how they give back to the community by giving backpacks to children in need. Located on 1st Street and Auer Avenue in the northeast Milwaukee neighborhood of Harambee, Malaika Early Learning Center is a state-licensed childcare center and a private, choice-eligible four and five-year-old kindergarten program that provides a safe, nurturing place for children to learn and grow. Enrolled children are from neighborhoods all across the city of Milwaukee. Over 90% of these families are at, or below the federal low-income levels. The school is impressive. The children are happy. The staff is proud. Classrooms are led by licensed, certified staff and are neat, clean, and bright -- everything a parent could ask for. The school boasts low 7:1 student-teacher ratios, music education by the Wisconsin Conservatory of Music, art education with Artists Working in Education, nature exploration with Schlitz Audubon Nature Center, French language classes with the Alliance Francaise and free transportation available to and from school. Greatschools.org rates Malaika 5 of 5 stars. As a choice school, Malaika relies on parents electing to send their children to their facility. But as a new school year approaches, a reduction in funding and declining enrollment threatens this impressive community resource. But, the staff is dedicated and hopeful. They work collaboratively with families to establish a strong academic, social and emotional foundation in the lives of Milwaukee’s economically disadvantaged children (6 weeks old to 5K), all of whom deserve opportunities for excellence in education regardless of their socio-economic situations or family structure; a service much needed, yet sadly, highly underutilized. Early childhood programs are the most cost-effective way to ensure the healthy development of children in poverty and offer the greatest social and economic returns to society. Despite its funding barriers, Malaika will hold its annual "Back to School Open House/ Picnic" on Saturday, August 10. This is a fun-filled outdoor event for children and their families. And despite its funding issues, the school has reached out to community organizations to donate supplies for this year’s giveaway. 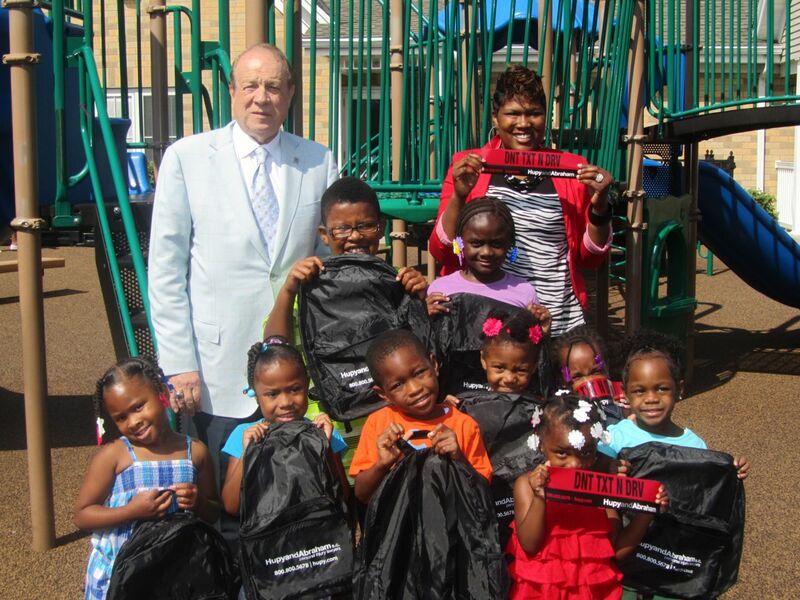 The law firm of Hupy and Abraham, S.C. has donated backpacks for the children in support of their mission. "It's important to take care of our community. We need to provide opportunities for our children and make sure they have a fair start in school," said Attorney Michael Hupy. Malaika Early Learning Center is located at 125 West Auer Avenue in Milwaukee. The phone number is 414.562.4997 or visit http://www.malaikaelc.org. On behalf of the staff, students, and families of Malaika Early Learning Center I want to thank you for your generous donation of backpacks and bumper stickers for our annual back-to-school event. We know our students are putting your gift to good use because we have seen so many of your Hupy and Abraham backpacks come through our doors this first week of school. Again, thank you so much for helping us kick off our year the right way. We cannot thank you enough! The children, board of directors, parents and staff of Malaika Early Learning Center gratefully acknowledge your $1,000.00 contribution in support of "Celebrate Malaika 2013." Your support will ensure the success of our annual event! We deeply appreciate your contribution. We are proud of the work done at this Center and supportive of its efforts.